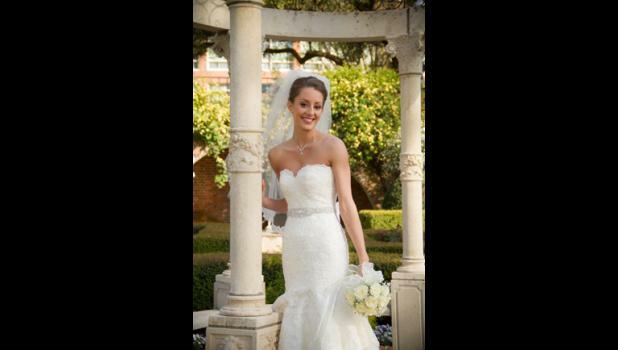 The bride is the daughter of Mr. and Mrs. Timothy Turman of Taylors, South Carolina. She is the grand-daughter of Mrs. Doris Hollan and Mrs. Nancy Turman, both of Ashland, Kentucky. She is a 2012 graduate of Blue Ridge High School and a 2016 graduate of Clemson University, where she earned a degree in Food Science. Emily will begin her studies at the Medical University of South Carolina School of Dental Medicine in June. The groom is the son of Mr. and Mrs. Jay Arrowood of Greer, South Carolina and Sherry Campbell of Jensen Beach, Florida. He is the grandson of Mr. and Mrs. Bruce Arrowood and Dr. and Mrs. Vic Campbell, both of Greer. A.J. earned a Biology degree from Mars Hill University in 2015 and is employed by TruTech, Inc. in Charleston, South Carolina. The bride was given in marriage by her father. Her sister, Sarah Plumblee served as matron of honor. Bridesmaids were Sarah Zemitis, Danielle Wilcox, Madeleine McMillan, Janie Rice, and Shannon Wood, all friends of the bride. The groom’s brother, Jake Arrowood, served as best man. Groomsmen were John Russo, Joey Russo, Nathan Wheeler, Will Nanney, and Chase Vickery, all friends of the groom. After a honeymoon to Clearwater, Florida, the couple will reside in Charleston, South Carolina.